Barcelona-El Prat Airport is your gateway to the enchanting cultural decadence of Spain. Barcelona-El Prat Airport is the main airport of Catalonia and a major international airport for flights to Europe, North America, South America, the Middle East, and Africa. It is the second largest and second busiest airport in Spain and the seventh busiest airport in Europe. Barcelona-El Prat Airport (IATA code: BCN) is a key airport for domestic arrivals and departures to Europe and international arrivals and departures to the rest of the world. It is the hub airport of Vueling. Flights to Barcelona-El Prat Airport Airport are provided by international airlines such as Emirates, Qatar Airways, and British Airways. BCN is a 25-minute drive or 35-minute train ride from the centre of Barcelona. Book your cheap flights to and from Barcelona-El Prat Airport online! Since aviation operations began in 1916, Barcelona-El Prat Airport has seen many aircrafts barrel along its runways and innumerable passengers pass through its terminals. Offering a gateway to the Mediterranean coast and the cosmopolitan city of Barcelona, the airport is the second-busiest in Spain. It is home to three runways, two terminals, and an array of retail and food outlets. Flights to Barcelona-El Prat Airport are operated by a number of domestic and international airlines. The airport also has its own commuter train and is connected to the Barcelona city centre by a bus line and underground metro. A wide range of shops and eateries adorn the interior of Barcelona-El Prat Airport. Whether you need to do some last-minute gift shopping or are in need of some wine and tapas to pass the time, the shops and restaurants at Barcelona-El Prat will not disappoint. Shops at Barcelona El-Prat Airport include: beauty and cosmetics, sports, tobacconist, jewellery and watches, pharmacy, fashion and accessories, convenience stores, toys, souvenirs, and electronics. Services at Barcelona El-Prat Airport include banking and foreign exchange, car hire, first aid, spa and salon, information desk, airport shuttle bus, lost luggage, and baggage wrapping services. Duty-free shopping is available in the departure area. Please be aware of baggage restrictions and duty-free allowances at your destination. Colomer VIP Lounge is open to passengers travelling on the Barcelona-Madrid Shuttle. Some of the amenities include air conditioning, beverages, flight information monitor, and television. The lounge is open daily from 6 a.m. to 9:30 p.m.
Joan Miró VIP Lounge is open to passengers on non-Schengen flights in Terminal 1. Some of the amenities include showers, beverages, flight information monitor, and television. The lounge is open daily from 6 a.m. to 11 p.m.
Pau Casals VIP Lounge is open to passengers on Schengen and domestic flights in Terminal 1. Some of the amenities include showers, television, beverages, telephone, and flight information monitor. The lounge is open daily from 5 a.m. to 10:30 p.m.
Canudas VIP Lounge is open to passengers in Terminal 2. Some of the amenities include air conditioning, beverages, flight information monitor, telephone, newspapers/magazines, and television. The lounge is open daily from 6:30 a.m. to 10 p.m.
Barcelona El-Prat Airport offers a number of facilities, including: ATMs, showers, post office, chapel, luggage storage and lockers, prayer rooms, children’s play areas, disabled access, meeting rooms, and telephones. This colourful 2-star hostel is conveniently located approximately 13 km from Barcelona-El Prat Airport and a short drive from downtown Barcelona. Amenities include a rooftop terrace, coffee shop, 24-hour front desk, area shuttle, a computer station, laundry service, air conditioning, and daily housekeeping. Complimentary Wi-Fi is available. This beautifully furnished 3-star bed and breakfast is situated just 9 minutes from Barcelona-El Prat Airport and a short drive from the beach. Some of the amenities include a bar/lounge, 24-hour front desk, air conditioning, meeting room, tour/ticket assistance, and breakfast. Complimentary Wi-Fi and parking is available. This hotel offers 4-star decadence just 8 minutes from Barcelona-El Prat Airport and 14 km from downtown Barcelona. Amenities include a restaurant and bar, outdoor swimming pool, fitness centre, 24-hour business centre, air conditioning, breakfast, and a cruise ship terminal shuttle. Complimentary Wi-Fi, parking, and an airport shuttle bus are also available. Foreign exchange can be purchased at an exchange bureau or ordered online up to 60 days before departing from South Africa. 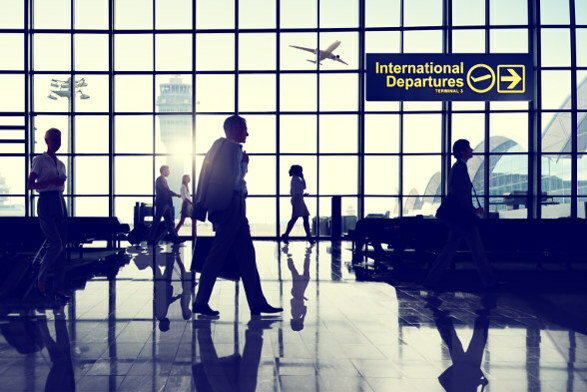 There are foreign exchange counters in Terminal 1 and Terminal 2 at Barcelona-El Prat Airport. The parking facility at Barcelona-El Prat Airport offers about 24,000 parking spaces: 12,000 are located near terminal 1 and 12,000 are located near terminal 2. A number of options are available, including general short-stay, first class, open-air, long-stay, corporate aviation, VIP, and spaces for motorcycles. Rates vary from lot to lot. Booking online will get you discounts on parking rates. Barcelona-El Prat Airport is located in the El Prat de Llobregat municipality, approximately 18 km southwest of the Barcelona city centre. A multitude of transport options are available to get you to your destination, including car hire, public bus, train, hotel shuttle bus, metered taxi, metro, and long-distance coach.